I had an interesting experience recently on LinkedIn that I thought I would share on the topic of kitchen layout… Being the astute businessman I like to think that I am, I posted the introduction of our new blog to the world of LinkedIn to try to request some comments like from my new friend John in Norway. Interestingly enough, I seemed to have inadvertently sparked a debate about how much space to give a kitchen vs. the dining room. Needless to say, there were some pretty strong opinions that were, and I tried to get them to continue that debate to the blog, but unfortunately they weren’t interested… Nevertheless, I thought I would share the debate and add my 2 cents to the issue on this and several upcoming posts since I don’t think I could do it justice in one writing. As a chef by trade, I take a different approach to space allocation… I’ve never attended a design school (or college, as you can probably tell by my writing style) and I am self-taught (with help of some good friends) in all aspects of AutoCAD, fundamental restaurant kitchen layout and hotel kitchen design practices, commercial construction principles and of course, code requirements. Sure, I probably could have learned my craft much more quickly in a school environment, but I think much of what I do and how I do it cannot be taught in a classroom and can only be acquired through experience by working in different versions of a standard kitchen layout. School seems to me, to be the place to learn the basics, the fundamentals, the classic way things are done. This is certainly a great foundation anyone could hope to have going into a new field, but to be honest… Some of the most talented and amazing chefs I was ever fortunate enough to work with were entirely self-taught! Now don’t get me wrong, I’m not taking anything away from higher education, I wish I could have the patience to do more of it myself, but I think the classroom can only take you so far… And in an industry as diverse and customized as this one, I don’t think any school can give you ALL the tools you need to become successful in the field of restaurant and hotel kitchen design. There is an old culinary school joke that I think holds a lot of weight in this subject… “How many chefs does it take to roast a turkey? The answer is 12, 1 to roast the turkey and the other 11 to stand around and tell everyone how they roasted a turkey at their last job.” I think this joke rings so true in the world of commercial kitchen design as clear by the debate the started on LinkedIn. What I will say for now is that I as much as I respect and agree with all the opinions shared by my colleagues on LinkedIn, I think they all missed the #1 fundamental aspect that every designer should look at before any discussion begins about space allocation… What are you going to make?… Let me see your MENU! Every Successful Restaurant and Hotel Begins and Ends… with its Mise en Place! 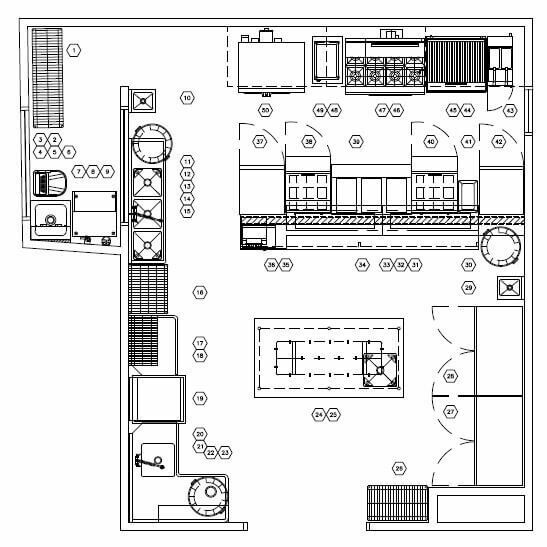 Now that you have all the information you need to understand how a sound approach to commercial kitchen design is important, keep these aspects in mind when you begin the process of selecting your location. We provide some valuable insight into selecting the perfect restaurant location in the articles below.